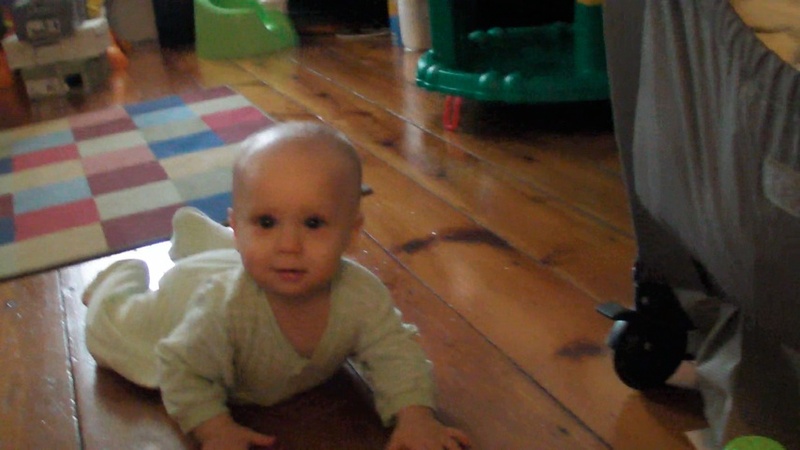 We Have a Crawler... And an Enthusiastic Big Brother! It also appears that Evan is going to be getting his top two teeth soon. This seems like a pattern - at seven months, he got two teeth and learned to roll over from back to front, and now at 8.5 months, he's getting two teeth and learning how to crawl! He can also sit very well now - he still needs our legs as a guard so he doesn't fall over, but he is enjoying having more playtime sitting up. He has been interested in this little music mirror toy we have, and that is fun for him to play with sitting up. Seth is funny - whenever Evan is playing with a toy that used to be Seth's, he develops a renewed interest in the toy and just has to use it right away. We've had a busy, fun couple weeks. We just finished celebrating Rosh Hashanah last week. We went to a nice dinner at Geema's house, and Seth was so sweet when we left - he gave handshakes/hugs to all of Geema and Michael's guests. One of Geema's friends decided to pass on his own son's (now in college) big boy bicycle to Seth - this was a very exciting event! It has training wheels but is still too big for Seth to ride. He is thrilled about the bike but bummed he has to grow a bit to ride it! It was fun to see Seth starting to understand more about Rosh Hashanah and other holidays - he enjoys reading books about the holidays, and kept asking us if it was Rosh Hashanah yet. We went to get ice cream at a local creamery with our friends from school - Seth had fun looking at the cows on the property, and of course, enjoyed the ice cream. The mosquitoes have been terrible these past few weeks, though, with all the rain - we are always trying to keep the boys from getting bitten because the bites swell up so much. We got the boys their flu shots - that was a fun experience, ha ha. Evan cried briefly and then stopped, but Seth cried for quite some time - the first time he had really done that. I think he felt betrayed that a shot did actually hurt, even though he pretends with the one in his doctor's kit all the time. This past weekend, we went pumpkin picking with Geema. We went back to the place we went last year - Brown's. We showed Seth pictures before we went so he would remember where we were going. Luckily, there was a break in the rain so we had a great couple hours on Sunday for our trip. We went on a hayride at the patch, and Seth was very interested in throwing the hay and in looking at all the sites on the ride. Evan was content to snuggle with me in the Beco and almost fall asleep. We all ran around in the corn maze - Seth thought this was a blast, and luckily we could follow his progress because he was roaring as he went through the maze. Seth jumped on hay bales, went down the slide, got to pose in a firetruck, and waited in line very patiently for a balloon animal maker to make him the animal of his choosing - a giraffe! Over the last couple days, this poor giraffe kept losing all of its twists and turns until it finally became one long yellow balloon - we told Seth it was just a really long giraffe now. He seemed to accept this fairly well. We picked out pumpkins and apple cider donuts, and decorated our porch with the pumpkins, and a pumpkin sign Geema bought Seth, and a Halloween sign Grams gave us last year. Seth keeps saying how beautiful our porch looks. It was a fun day, and we were happy to have Geema along. Seth is continuing to grow and thrive at Tiger School. So far, they have been learning about apples, colors, and shapes in September, and in October they are starting to learn about leaves, pumpkins, and autumn. Seth is very precise in describing their routines at Tiger School - what his job is, what song they sing, what book they read, what centers he chooses, what art project he does. It helps when we prompt him with questions about these things. We love hearing about everything and hanging up his artwork all around the house. He is learning to trace the letters of his name and draw lines between objects. He has gotten very interested in letters - he will point them out and say them wherever we go, and he always wants to make very long words with his bath letters and numbers - like KP3TY80NJHKD39 - and then asks us to read the word to him! Evan is making lots of little leaps. He likes to point excitedly at his mobile when we put him in bed, as if to say "Look at this!" We've found that he really needs to get his two naps in (one around 9am and one around 1pm) or else he is off for the whole day. He doesn't fall asleep as easily now outside his crib, so this is a challenge if we are having an outing. He's so active, always pulling, grabbing, patting, pointing, putting toys in his mouth. He loves eating, and we've been teaching him a couple baby signs, like for eat and more. He watches me wide-eyed and then wonders why we're am not feeding him at that moment. He's started to associate this little smacking noise with eating, and this is our little private joke - we always laugh back and forth with this noise. Life is good, we are happy. Jason and I are blessed to watch Evan and Seth laughing, and we can't wait to see them get into more adventures together.